Making a donation in memory of a loved one is a positive way to celebrate a life whilst helping other families to receive our care when they need it most. At Cransley Hospice, we know that dealing with a loss can be very difficult, particularly on an anniversary, at Christmas and on other special occasions. Everybody finds their own way and everyone will know what is best for them.We hope that some of the options shown below will provide a meaningful way for you to pay tribute to the loved one that you miss. Donations can be collected from well-wishers at funerals or made in lieu of flowers. Cransley Hospice Fundraising Office, St Mary’s Hospital, 77 London Road, Kettering, Northamptonshire NN15 7PW or you can make a donation online. You can set up an online memorial tribute page dedicated to your loved one and personalise it with photographs, music and messages. We use a website called 'Much Loved' to host the Cransley Hospice Scrapbook of Memories. The memorial site is completely free to set up and you have complete control over the site, which can be accessed by friends and family wherever they may be in the world. You can also light candles and make donations to Cransley Hospice in their memory. Many people find that creating an online tribute is a very helpful bereavement tool. If you have set up a Tribute Fund at the hospice, all donations made to your page will also be attributed to your fund to help it grow. To get started either visit our page by clicking here and follow the instructions or contact us for further support. Often, family members and friends of the deceased want to do something positive and lasting in celebration of their loved one’s life. By setting up a tribute fund in memory of a loved one, you extend their legacy by ensuring that all funds donated to Cransley Hospice from you, your family or friends are given in their name. Tribute Funds may start with funeral donations but we can also backdate donations therefore it can be set up at any time. Whether or not your loved one received care from Cransley Hospice, you can set up a Tribute Fund in their name. This unique and personal way to pay tribute to someone who is dearly missed, honours their memory by providing a positive focus for everyone who knew them. 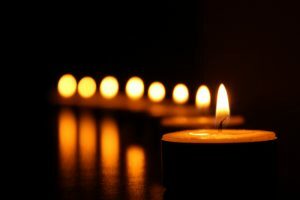 Christmas can be particularly difficult following bereavement. It can trigger many different emotions including celebration and remembrance. The Tree of Lights gives us the opportunity to remember and celebrate a life in a positive way. People from all faiths and beliefs are invited to remember a loved one or to honour a friend, relative or colleague with our cherished Tree of Lights service. Cransley Hospice holds an annual Tree of Lights service for the local community every year. The 2019 event will be held on Sunday 1st December, please check back for additional information coming soon. We were also delighted to launch a very well attended 'Lanterns at the Lakes' in-memory event in Spring 2019. Details for the 2020 event will be released in the coming months so please watch out for further details.